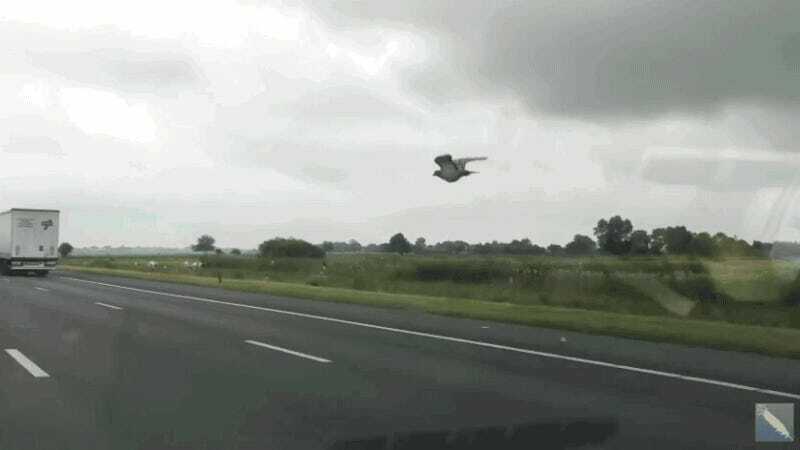 A motorist in the Netherlands captured remarkable footage of a dove as it flies alongside vehicles at speeds reaching 60 miles per hour. Incredibly, this daredevil of a bird was able to fly with highway traffic for over 12 miles. This video of a bird flying alongside vehicles on the A2 Amsterdam-Utrecht highway seems too good to be true, but it’s scientifically plausible. The video identifies it as a pigeon, but it’s clearly not of your city-dwelling variety. It’s probably a homing pigeon, which can reach speeds of 50 mph or more, while flying for hundreds of miles. And in fact, homing pigeons are used in competitive pigeon racing. But given that there are about 310 species of pigeons and doves (the terms are often used interchangeably), it’s hard to know exactly what kind of pigeon this really is. Either this bird is having one hell of a thrill ride, or it’s terribly confused about who its flock really is. Or it’s on bath salts. Regardless, this winged racer is our new hero.